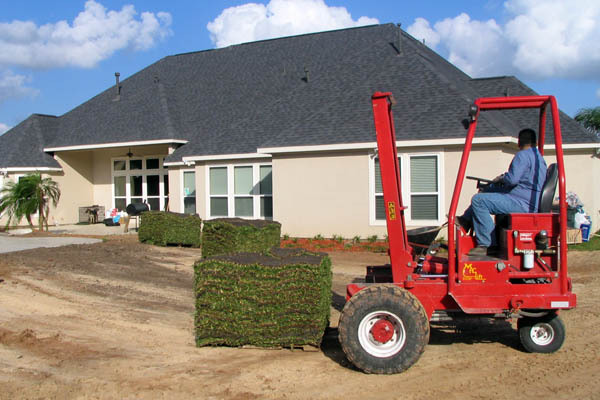 Here are turfgrass care and maintenance tips to help your new sod thrive in the demanding climates of San Antonio and Austin or anywhere in Central and Southern Texas. Please give us a call at 1-800-753-5182 or 1-979-244-2496 for more information or a quote. There is one basic concept to always remember when making a varietals selection of turf. When you’re ultimate goal is to create an eye appealing lawn, your inputs of water, fertilization and mowing practices are all basically the same for each commercially available variety. January-March *Note that with average water pressure, a “wand” style sprinkler will put out about two-tenths of water per hour so it takes 5 hours to put out 1 inch of water. To verify your particular water output, purchase a rain gauge and put it in the area to be watered. 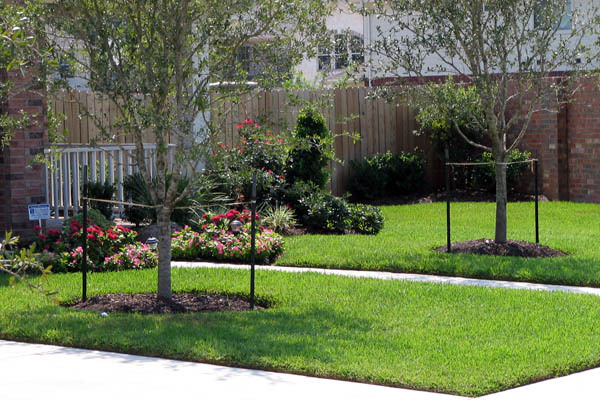 If you have a sprinkler system, we would highly recommend that you do this. 1 inch (5 hours with a wand sprinkler) the day grass is installed or until “squishy”. Then 1 inch every 7-10 days. When you can no longer pick up corners reduce watering to 1 inch every 2-3 weeks. A good rule of thumb is if you can stick your finger into the ground and mud sticks to it, then you do not need to water–if the ground is hard and you do not feel any moisture, then turn the water on. Be sure to compensate for rainfall. April Once daytime temperature consistently exceeds 80 degrees, watering requirements must be increased to 1.5-2.0 inches (7-10 hours with wand sprinkler) day installed or until “squishy.” Then 1/2 inch (about 2 hours) every other day for 2 weeks. When you can no longer pick up corners reduce to 1 inch a week (ideally you would do this in two-1/2 inch waterings to prevent runoff). May-September 1.5-2.0 inches (7-10 hours with a wand sprinkler) the day installed or until “squishy.” Then 1/2 inch (about 2 hours) every other day for 2 weeks. 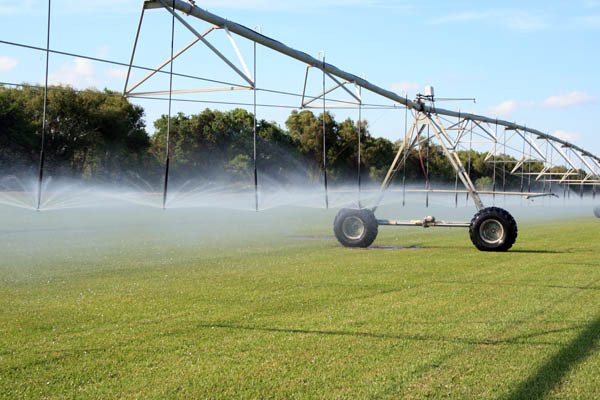 This depends on daytime temperature; if the grass is wilting and stressed then short 30 minute waterings on a daily basis may be necessary in the evenings. When you can no longer pickup corners, reduce to 1 inch per week (ideally you would do this in two-1/2 inch waterings to prevent runoff). October 1.5-2.0 inches (7-10 hours with a wand sprinkler) the day installed or until “squishy.” Once daytime temperature consistently stays below 80 degrees, then watering requirements must be reduced, so as to not promote Brown Patch, to 1 inch every 7-10 days, then every 2-3 days for 1 hour. When you can no longer pick up corners reduce to 1 inch every 2-3 weeks. November-December 1 inch (5 hours with a wand sprinkler) the day installed or until “squishy.” Then 1 inch every 10-14 days. When you can no longer pick up corners reduce watering to 1 inch every 2-3 weeks. 1 inch every 2-3 weeks. Be sure to compensate for rainfall. 1 inch (two-1/2 inch waterings if runoff is an issue) every week. January Note that if you are following the suggested watering requirements, you will probably not be able to mow without leaving ruts for at least 2 to 3 weeks no matter what time of year you plant. If you plant in January, the grass will be dormant and will not be growing. Keep the mower off of it until it begins to green up in the spring (around March 1st). February If you plant in February, the grass will be dormant and will not be growing. Keep the mower off of it until it begins to green up in the spring (around March 1st). March If you plant in March, the grass could possibly be greening up and coming out of dormancy. Keep the mower off of it until it does begin to green up then do the following: keep the mower off for 2 – 3 weeks, then as the grass begins to attach itself to the ground (you can no longer pick up corners), you may raise your mower to at least 3.5 inches (barely clip the top of the leaves). April If you plant in April, the grass will certainly be greening up and coming out of dormancy. Keep the mower off of it for 2 – 3 weeks, and then as the grass begins to attach itself to the ground, you may raise your mower to at least 3.5 inches. Keep the mower off of it for 2 – 3 weeks, and then as the grass begins to attach itself to the ground, you may raise your mower to at least 3.5 inches. January-March Three (3) inches. 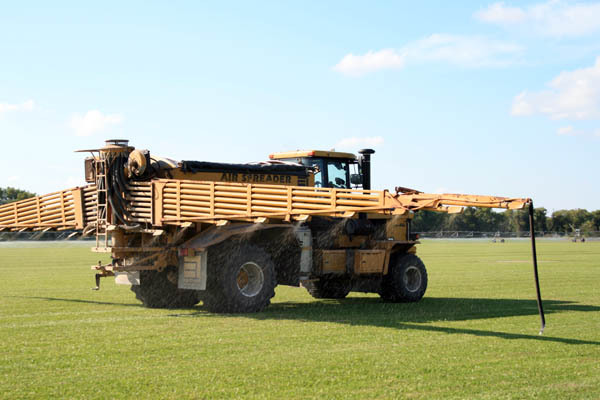 It is recommended that you do not remove grass clippings as they provide a good source of nitrogen and organic matter. April-May Mowing height may be adjusted downward to 2.5 – 3.0 inches. Remember to never remove more than one-third of the leaf–this causes undue stress on the grass. June-September Mowing height must be adjusted upward to 3.0 – 3.5 inches so as to increase the drought tolerance of the grass. October Once the daytime temperature starts to fall, the mowing height may be adjusted back downward to 3.0 inches. Note that after the first frost, your grass is going to begin to turn brown. This is the grass transitioning into dormancy and will remain brown until temperatures begin to rise in the spring. There will be little to no growth except for winter weeds. We suggest mowing those as opposed to treating with chemicals. March-April Wait 3-4 weeks after the grass was planted then apply a 15-5-10 (Vigoro has one) fertilizer at a half rate (0.5-0.75 lbs) per 1000 sq. ft. or half of what is recommended on the back of the bag. May-September Wait 3-4 weeks after the grass was planted then apply a 15-5-10 fertilizer at a half rate (0.5-0.75 lbs) per 1000 sq. ft. or half of what is recommended on the back of the bag. April Apply 1-1.5 lbs of a 15-5-10 fertilizer per 1000 sq. ft. You will need to determine the square footage of your yard. The label on the bag will tell you at what rate your spreader should be set at to distribute the fertilizer at a rate of 1-1.5 lbs per 1000 sq. ft. Suggest use of Bonus S or other fertilizer impregnated with Atrazine or 2-4-D to suppress winter broadleaf weeds. CAUTION: these chemicals will kill plants & ornamental flowers, be careful when applying! September Apply 1-1.5 lbs of a 15-5-10 fertilizer per 1000 sq. ft. You will need to determine the square footage of your yard. The label on your bag will tell you at what rate your spreader should be set at to distance the fertilizer at a rate of 1-1.5 lbs per 1000 sq. ft. Suggest use of fertilizer impregnated with Bayleton to help prevent brown patch. June-August Chinch Bug Season – Chinch bug damage looks very similar to drought stress. First signs of chinch bugs are found near concrete and warmer, dryer areas of the yard. A variety of liquid and granular insecticides are available to control chinch bugs. Apply 1 inch of water 24-48 hours before treatment then at least 1/2 inch after application. Be sure and follow instructions carefully. Applications should only be made if infected areas continue to grow. Additional irrigation, no fertilizer applications, and rainfall may help suppress chinch bug infestation. January – March Suggest mowing when winter weeds appear as opposed to treating with chemicals. April You may apply Bonus S with Atrazine to control winter broadleaf weeds. Consult a licensed chemical applicator such as TruGreen for additional treatment options. October – November Once the grass begins the transition into dormancy, you may wish to consult a licensed chemical applicator such as TruGreen to apply a pre-emergent in order to prevent winter broadleaf weeds from appearing in late winter into spring. Suggest mowing when winter weeds appear as opposed to treating with chemicals. The primary fungus that St. Augustine must contend with is Brown Patch which normally appears in September and March (during temperature transitions). Once the daytime temperature is between 75-85 degrees and the nighttime temperature is below 68 degrees, the conditions begin to be conducive to the disease. Only water when necessary (every 2-3 weeks) and do not apply any fertilizer until the cooler temperature transition is complete. Look for a circle with a gold ring around the edge. When you see the first signs, Terrachlore is the product of choice, but it is difficult to find. Scotts Lawn Fungus Control or Turficide is an alternative that can be found at home improvement stores. Begin watching for Brown Patch in low lying wet areas. If you see signs (gold rings) refer to instructions in March-April.